The 2/3’s transition class has a maximum enrollment of 17 children with three teachers. We recognize that two’s are no longer toddlers, however, they are not yet preschoolers either. Many changes typically occur during the "terrific" two’s year. 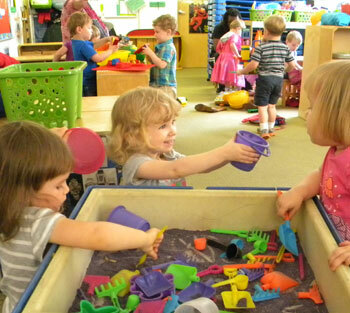 Most obvious is speech and language development that grows in leaps and bounds during the second year. We believe that this unique age group requires it’s own special grouping, complete with age-appropriate activities, equipment, materials and expectations. Our daily program concentrates on developing emergent skills, which will prepare your child to be learning ready to enter our Preschool Unit during their third year. Primary focus is placed on growing self-help skills such as; mastering use of utensils and self-feeding , putting on clothing and shoes, putting items away after use, and toilet learning. Activities, that promote small and large muscle coordination are offered throughout the day. Typical small muscle exercises include; cutting with safety scissors, pasting, painting, working with puzzles, and playing with play dough. The indoor environment also includes books , dramatic play, art, science, social studies, music, sensory, and manipulative areas. Large muscle exercises take place indoors and outdoors. We take frequent walks through the neighborhood and our outdoor playground facilities provide plenty of opportunities for running, jumping, using climbing equipment, using balls and more. There is also in indoor area in which to run off energy during inclement weather. As two’s move into their third year, their attention span grows, their vocabulary becomes more elaborate, and their thought process becomes more complex. It’s now time to make the transition to the Preschool Unit.